for it keeps us both fit and happy, and it should not be a crime. please protect me, and protect my baby, and show us respect! Technically, we are having the picnic on the tiny stretch of pavement you can see here, facing onto St Margaret Street. In reality, we will be on the grass in the centre of the Square. No one will mind, as long as we don’t breaks the rules. So please don’t bring homemade banners or anything. At the ‘back’ of the square, is a concreted area with statues and benches, and some nice shady trees. Centre of the green, however, will be safest, as it’s the furthest from the road in all directions. Buses come into this area from all around. 3 and 87 stop on St Margaret Street. The nearest Tube is Westminster. Which is a few hundred yards away, down Bridge Street. Westminster Tube is disabled accessible, so it has lifts from all levels, up to street level. The final little lift up to the street, is the Bridge Street exit. So buggies and strollers are fine from that approach. You literally emerge under the shadow of Big Ben. (And there will be tourists taking photos.) You emerge into a very narrow and crowded pavement – so grab children by hand first. You turn right down Bridge Street. You can see all this in very good detail, on Google Maps, if you input SW1A 2LW and click to ‘satellite’. Zoom in, and you will see that the Underground is very close. You will also see the trees and paved area on the Square. Car parking is very expensive and street parking lethal to try and get into. Disabled badges are not valid for double yellow lines etc, in Westminster. However, if you park across the river, you are in Lambeth, and blue disabled badges are valid there. Crossing into the Square is very dangerous. Presumably, for security reasons, the corners of the crossing areas all around the square, have railings that close off access to the Square at the corners. 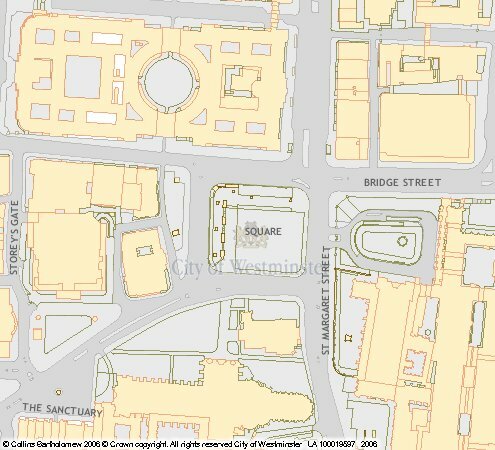 So the safest approach, especially with buggies or prams, and wheelchairs, is to cross over in the middle section at the top of this map (Great George Street). We will have people to help, but the nice policemen there will help too. Given we are at the centre of Government, and right next to Downing Street, there are a lot of nice policemen on the ground. Above Westminster Underground Station as you emerge into Bridge St, in the shadow of Big Ben, is a Tesco Express. It is a long thin corridor, stuffed with food, drink, crisps, chocolate, sandwiches and MP’s ‘run around people’ elbowing the tourists out of the way. The queue is awesomely long looking (the length of the shop) but there is 5 or 6 tills at the end, and it goes fast. No mother should be in Westminster, and not know it exists. Equally, the danish pastries are at toddler grab height. There are no public toilets in Westminster. The best bet, is Central Hall, which has a lovely cafe and nice toilets. It’s in Storey’s Gate, on the left of the above map, directly ‘behind’ us. It has a lot of fancy stone steps, so if you have a buggy, go for the disabled access entry. The cafe is ground floor. Most of us will end up there for tea and scones afterwards. Ironically, the nearest toilet and cafe, and a lovely ‘wet weather’ area is actually inside Parliament. Westminster Hall is a wonder to behold, big enough for toddler freedom, has toilets and a cafe at that level, and is level access if you ask to be escorted down to the far door. Anyone can enter Westminster Hall, but you have to go through police security. If you have never been in, it is worth a look. If you appear to be part of the event on the Square, they may refuse you. So don’t try and enter with banners, badges etc. But if you have time to go through security (anywhere from 3 to 30 minutes) it is well worth a look. You can use a camera in there too. We’d like you, if possible, to invite your MP to the picnic. The Square gets hot and baking in the sun, and there is no shelter in the rain. So prepare for both. We will be sticking to the Square in the rain, but you can shelter in either Central Hall, or Westminster Hall, or explore the options at Westminster Abbey, if it gets too much for you. Bring your picnic, and something nice to sit on the grass with. Bring a rubbish bag, for clearing up. If are a baby wearer, babies and younger toddlers best strapped to you. Older toddlers and young children will need one adult to one child for eye-keeping on (traffic) or need to be tied to an adult with reins, rope, or a Houdini type fastening. We will have adults without kids there, and we will endeavour to help with games and letting them run about for part of the picnic, but we cannot stress enough that keeping the children safe is a priority. This sounds harsher than it is, for there was no problems last year, but it’s important to stress that you will need to be vigilant. Do not bring balls, Frisbees or anything likely to cause a child to run after it. Small kites would be cool! Bring cameras and take a lot of photos for our photo album. Learn the words to the song, and join me singing it! If you have any particular special needs (such as knowing you are bringing a couple of walking kids and there is only one of you) email us and we’ll give you our mobile phone numbers in case you need help etc. breastfeeding.picnic@googlemail.com Also email if you can offer to help. What a lovely blog! I am breastfeeding my toddler and facing the ”subtle criticism” of Nordic women who keep telling me ”when my kids were this age, they stopped breastfeeding, they lost interest”, ”when my daughter was this age, I told her ”you’re too old” and she stopped… I suspect they tell me these stories to get me to wean to avoid criticism, but I am standing tall and fighting for my daughter’s right to nurse for as long as she wants. Does anyone know anything about a breastfeeding walk/picnic in Sefton Park, Liverpool on Monday – I think it maybe to do with this issue.